A few years ago we thought it would great to go camping again. It had been such a long time. Buy packing, unpacking, air mattress on the hard ground had lost its appeal. Someone mentioned a truck camper and after several conversations the idea took hold. Soon we had our very own Lance camper. All the comforts of home in a very small space on the back of our pickup. Our vacation home was love at first sight! We went on several weekend trips that summer. By the time we got home from one weekend trip we were planning our next one. This really is the way to travel. Our 230 lb English Mastiff fur kid, Beau, traveled with us, at least at first. While he enjoyed being with us he didn’t really like his outdoor sleeping arrangements. After awhile though, we had to put him in the kennel when we traveled as it was getting too difficult for the old guy. There were a few missteps along the way. We traded in our Silverado for a Sierra 1 ton dually. (Insufficient research on our part) The Silverado just wasn’t strong enough. Next after just a few short months one of the jacks was rusting out. While still under warranty, the dealer and manufacturer took care of things but we were without for a few weeks. One of the downsides of rv ownership. We were really enjoying this lifestyle. As much as we liked the Lance, we were beginning to doubt the feasibility of traveling on long trips. It was getting costly to put Beau in the kennel while we traveled. Living space and storage space was limited. More conversations on what we should do. Then deciding it was time for a change. One day we found ourselves at the Pomona RV Show. William was sure he didn’t want to pull a trailer or fifth wheel so we concentrated on motor homes. We settled on a Forest River Sunseeker. A great ride and very comfortable. Now then was room for Beau and could take him with us every trip. Beau was happy riding up front between the two of us, sleeping by his people at night. And it fit in our driveway. An added bonus, no storage fees. It seemed the more we went out on weekend trips, the more we enjoyed the RV lifestyle, the more we really didn’t want to come back home. While we really liked the Sunseeker the space inside was crowded, storage limited. On the road the passenger side was very hot as my legs were crowded next to the engine compartment. The shower was small and the couch doubled as our dinette. Great for short trips. After many discussions we considered if we really wanted to rv travel we would be much happier with a class A. We contacted the salesman we had dealt with previously, went to the dealership (they were getting very happy to see us). We looked at several coaches that fit our criteria then finally settling on a Georgetown. We were quite happy with this coach and had it about a year. After a while we both accumulated enough vacation time to take one long cross country trip to see family in Kansas and Virginia with a little siteseeing along the way. What a joy not to deal with airports, rental cars, hotels, eating every meal out and sleeping in strange beds. We ate “at home” when we wanted as our kitchen was fully stocked. No suitcases, never had to pack or unpack until our trip ended back home. Slept in our own bed each night. No kennel for Beau who was quite happy traveling with his people day and night. Still it was a fast and hectic three week whirlwind. We did have one problem with Beau. Generally he had a hard time knowing what his rear end was doing at any given time. (stretching to over six feet). The door and steps were right behind the passenger seat. He slept between the driver and passenger seats, head next to us, rear right next to the steps. He’d be peacefully sleeping and snoring while we were driving along, stretching every now and then. After awhile his back end would slowly slide down the steps, especially after a turn, scaring the Big Guy. While it was quite funny, it was also a bit scary on the off chance the door would accidentally open while driving. William ended up installing a temporary platform over the open space which solved that problem. That trip was a good test. At William’s Dads home in Kansas City we ‘boondocked’ in the driveway. Stayed at a nice rv park in Williamsburg, VA visiting our son and his family. Overnighting at rest stops and getting a reservation on the fly at rv parks when we wanted hookups. That trip started the idea that we’d really like to be full timers. Knowing we wanted to travel once we retired, rving seemed to be the best way to fulfill that dream. 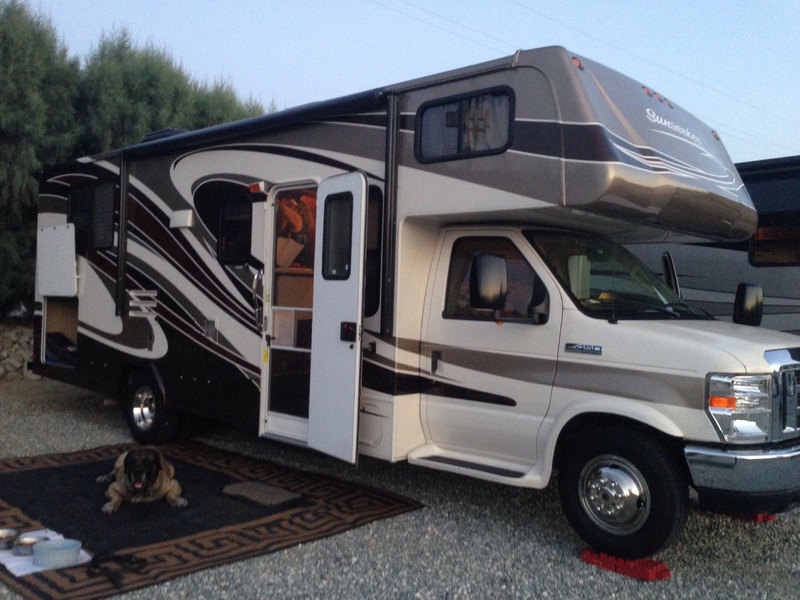 We discussed, studied, talked to fellow rvers, read blogs. Could we afford it? What about the house? Would the Georgetown be big enough and durable enough to live in? Lots of questions, answers came slowly. In the end we worked out a budget deciding the only way to really afford this was to sell the house, which we did, and got rid of 99% of our belongings. William insisted that for him, a diesel was the best way to go, which the Georgetown was not. Nor was it big enough, in our opinion, to really handle full timing. We took our time looking for our next rig. And we found it, a Nexus RV Bentley. We dealt directly with the factory which enabled us to make changes and additions to suit our needs. We picked up our new home in September 2015 in Elkhart, Indiana. It’s been about a year and a half now. A lot of learning, a few repairs, a different way of living. Material things aren’t so important now. This is our home on wheels and quite happy with it. We have both retired. And in a few weeks we’ll embark on the biggest adventure of our lives. The one sad note, our Big Guy is no longer with us. Just a few days after we returned from Indiana he suddenly passed away at home. Beau was just short of twelve years old. He never got to live in our new home.